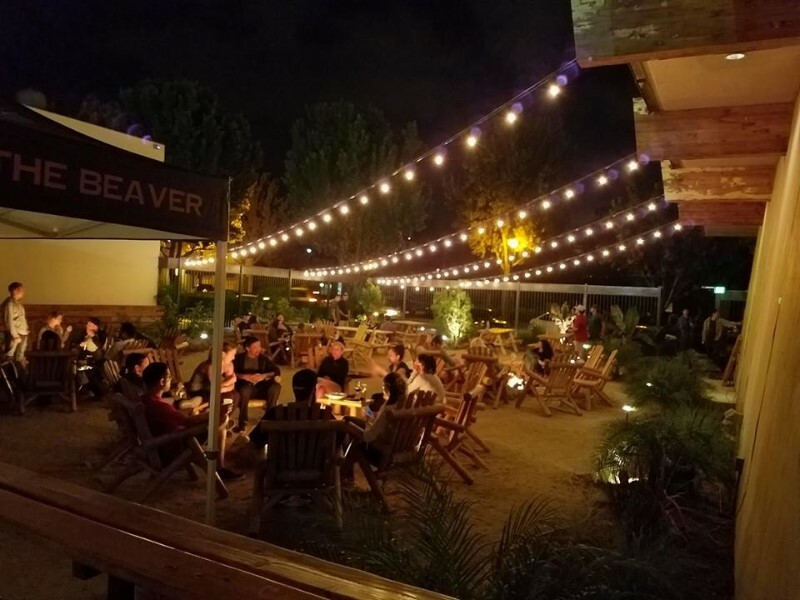 On Friday night, my boyfriend and I met some friends at the Belching Beaver, in the revitalized downtown Vista area. 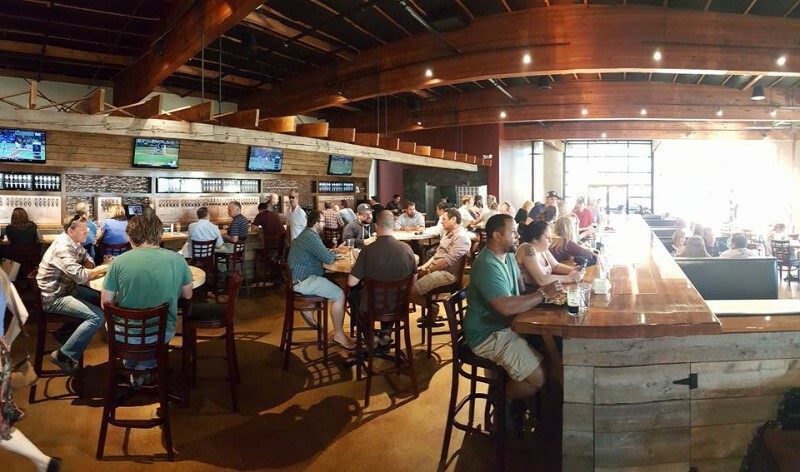 They also have a brewery in Vista (980 Park Center Drive). This is more of a restaurant and bar setting with indoor and outdoor seating. 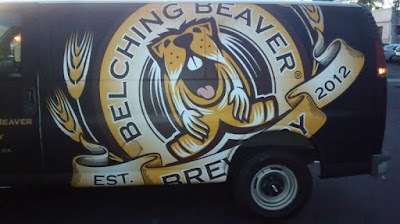 Belching Beaver is located in the old First National Bank building on the corner of Broadway and Indiana. Their official address is 302 East Broadway. There is no sign to distinguish the place but their truck is normally parked in the small parking lot (come early to find parking downtown). They are open 3pm-9pm Mon-Wed, 3pm-10pm Thurs-Fri, 1pm-10pm Sat, and 1pm-9pm Sun. (They are located directly across the street from The Yellow Deli). There are three areas to enjoy at this establishment. A large indoor seating area, a dining patio, and to the right of the building, a backyard area that has lots of sand, benches and chairs, fire pits, game areas, and serves finger foods and more bar type foods. The front outside dining area and inside serve more interesting and pricier choices made by their onsite chef. They also have a nightly chef's special. 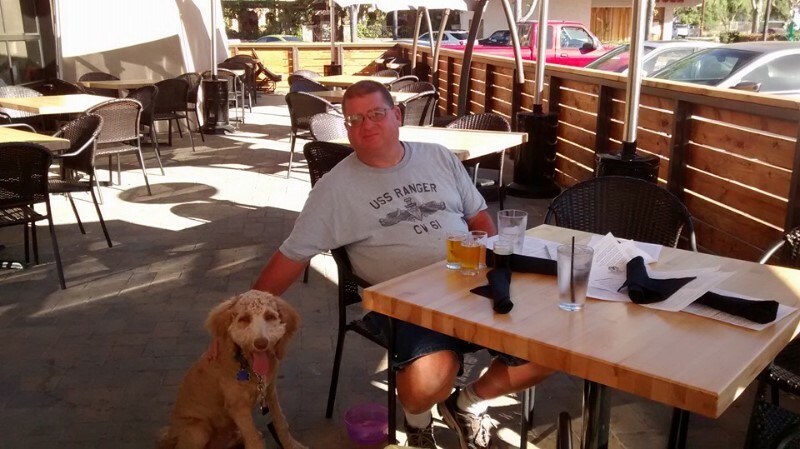 Both outdoor areas are dog friendly. It was very hot outside so at first, we were the only ones on the patio. They have umbrellas, but as the sun went down, there was no escaping the sun in our eyes. One of the workers informed us they are getting sailcloth to block the sun so that will be a welcome addition. The staff are all nice and attentive, but service can get a bit slower as the place fills with people. Our waitress, Jessica, was amazing. Very friendly and so knowledgeable about the beers, wines, and food. You could tell she enjoys her job. There is an extensive beer menu. My boyfriend tried 8 small (5 ounce) beers ($2 each). You can pick any beers you want to try, any amount, for the $2 each. I had a glass of wine as I do not like beer. (They also have an extensive wine list). Our friends also tried a variety of beers. My boyfriend's favorite (and also some of our friends' favorites) were the Belching Beaver Peanut Butter Milk Stout Nitro (everyone loved this), the Mango beer, the Raspberry beer (cannot remember the name of it), and the Hofbrau Hefeweizen. They tried a number of other beers, but these were the favorites. The next three pictures are from the Belching Beaver website as I was unable to take pictures inside and outside in the sand area due to the crowds. We stayed at the Belching Beaver for four hours. In that time, we had a chance to order a number of appetizers and split them. The food is delicious and unique. Many of the items were made with beer so I steered clear of those, but my boyfriend and friends tried some of them. My boyfriend tried the Andouille Corn Dogs, which he loved. 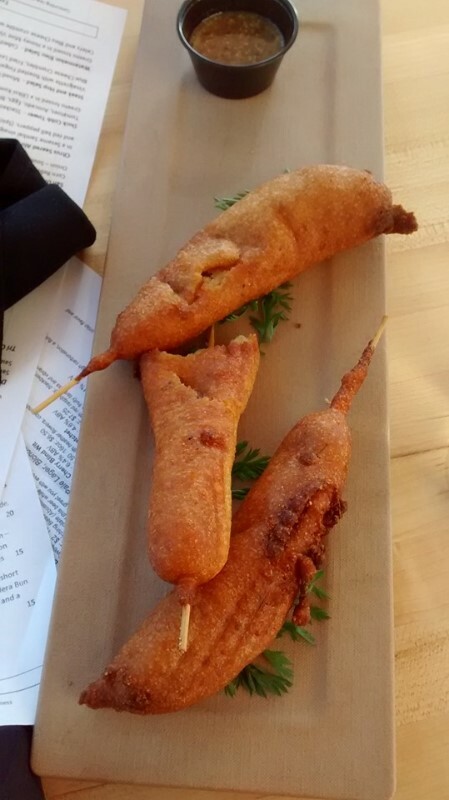 They are made with a Southern style Andouille sausage dipped in their Hop Highway 78 IPA corn meal batter and served with a honey mustard sauce made with the Me So Honey beer. 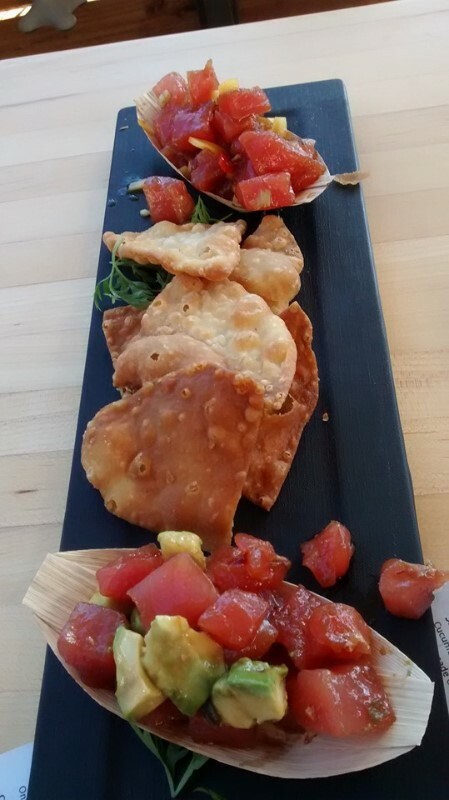 We split the Dueling "Pokes", two types of ahi poke, one with a smoked poke sauce and one with a mango/tropical sauce. So good! 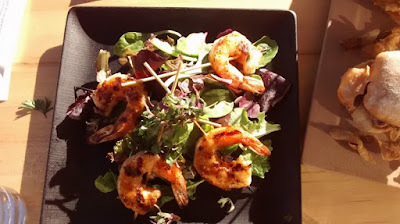 My boyfriend later tried the Fire Grilled Shrimp Skewers which have a citrus soy glaze and are served over local organic greens. 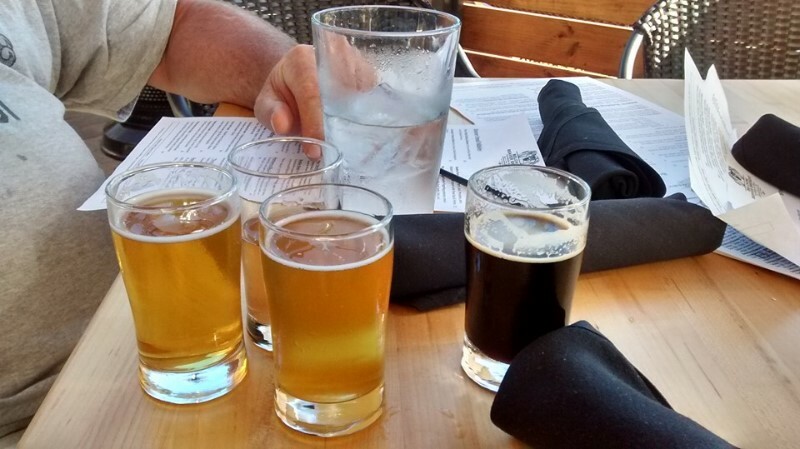 The Belching Beaver uses a lot of locally sourced organic ingredients. I later found out you can order the bar food from the other side and enjoy it on the dining patio, so I ordered a small Caesar Salad. It was one of the best I had ever had (but I forgot to take a picture of it). 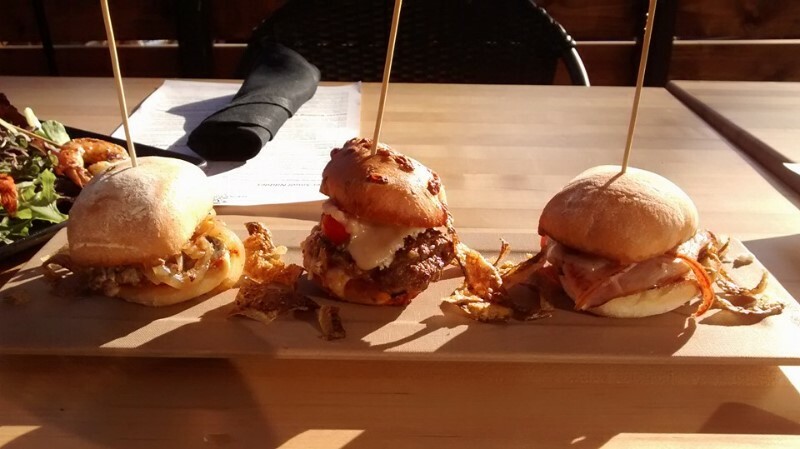 We also split the Tri City (three different sliders). One is a house-made poke Brat patty with a stoneground mustard made with the Me So Honey beer. I took one bite of this particular slider and gave the rest to my boyfriend. I did not like it at all (probably the beer taste), but he enjoyed it. The second was a chorizo slider which I liked quite a bit and he did not care for. The last was a Cubano slider that I loved. The Belching Beaver also serves flatbreads (in which the bread itself is made with brewers yeast and Damned IPA), a number of interesting salads, burgers, seafood, steak, stuffed meatloaf, pork chops, and something called the Brontosaurus Bone ( a giant braised beef rib). My friend ordered the Fried Cauliflower and Leeks. I have to say, the fried leeks were amazing!! Could have eaten a bowl of those. A couple of the guys ordered the BBQ Short Rib Sandwich. They liked the meat but felt the bread was soggy and greasy. 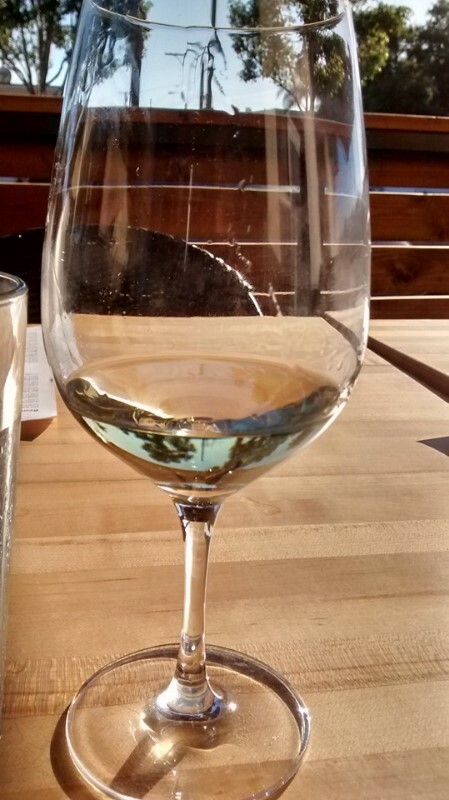 For two of us, between the beer, wine, and food, the bill came to almost $100. 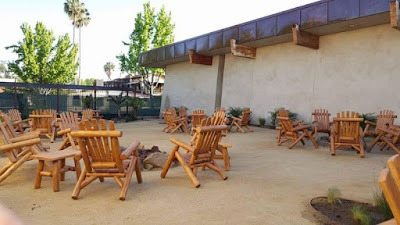 The food from the other side (sand area) is quite a bit less expensive, but you have to ask to see that menu if you are not sitting in the sand outdoor area. (More fries, burgers, wings, finger food items). All in all, it was a pleasant experience and we would definitely go there again. A great place to meet friends, talk, try new things, and relax.